I have been so use to a 2 slice toaster but now I have a 4 slice toaster. It makes great toast and so easy to use. Kitchenaide is a great brand and this was at a great price! Beautiful and matches my red ice maker. 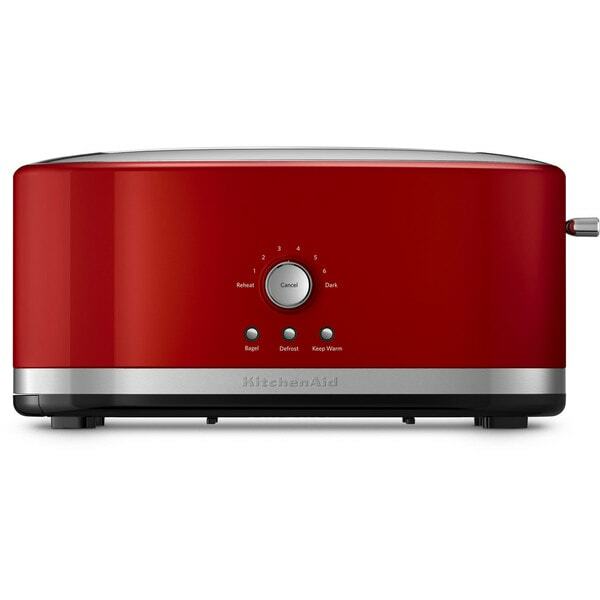 KitchenAid's KMT4116ER 4-slice long slot toaster, in empire red, features simple, programmable, start-to-finish toasting. The extra-wide slots accept the thickest bagels, breads, or pastries and the extra-deep, steel toasting cavity ensures even browning. The racks automatically adjust the slot width for thick or thin slices, keeping food upright for even toasting. Selecting the bagel toasting function reduces the power on one side of the heating elements by 50 to produce a better toasted bagel. With the defrost button, frozen pastries can be toasted to perfection in minutes. The keep warm mode keeps bread warm for up to 3 minutes after toasting. The peek & see function allows you to check on your food without stopping the toasting process. When your food is ready, the high lift lever makes it easy to get it out of the toaster. The reheat setting quickly reheats toasted food in under a minute. Plus, the adjustable 7-shade setting ensures your food pops up just the way you like it. PROS: Toaster has a one time not too annoying beep when done toasting. All element segments glow orange for even toasting. The "lift and peek" without stopping toasting cycle function is great for checking toast without restarting cycle and burning toast. Nice wide slot will squeeze in three slices of narrow Pepperidge Farm raisin bread on each side and toast six slices at once or two thick center sliced mountain bread slices or Large Einstein everything bagels. The bagel setting will toast the inside of the bagel 50% more than outside to prevent over toasting outside and making it crunchy. There is a button for defrost that adds time, yet I have not used it as I set the toast setting to 5 and always toast frozen bread. There is another button that will keep the toast down after toasting for up to three more minutes and will run the toaster at a very low setting to keep the toast warm without burning while you finish cooking your eggs so the toast will remain warm. The full top of toaster is flat chrome without any cracks or ridges that can trap crumbs for easy daily wipe down after use. CONS: The cord is thick round and only three feet long with safety ground. I was using a 6 ft extension cord without ground hole to behind fridge outlet and needed to change extension cord. The toaster is larger in both width and length than the same 10 inch slot length discontinued 12 year old Cuisinart bagel toaster I am replacing. With the round raise/lower knob, you need a full 17 inch width counter clearance as the knob sticks straight out the end of the toaster. The crumb tray has very small side rails and will need to be emptied often and the push to release spring mechanism feels fragile and likely a future point of early failure. The crumb tray is fully flush to side of toaster when inserted and looks nice if release does not break. Disclosure: Paid for writing honest review. 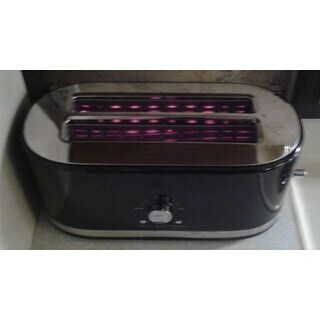 I really like this toaster. It can toast 4 regular slices two extra long slices and also bagels. Once you find your favorite setting this thing toasts accurately and quickly. Does not toast evenly. One side of toast is lightly toasted while other side is fully toasted. 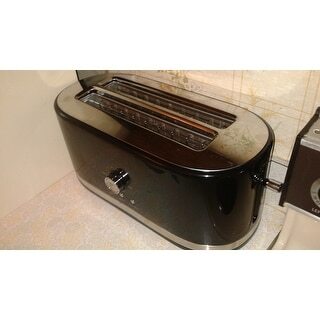 This toaster has great look but two things are negative. It must be unplugged after every use to push against wall or it sticks out and doesn't look very nice. We have had this toast only about one year and needs replaced as it is on highest setting "6" to actually get bread on any type "toasted". Heating elements apparently don't last long. Unfortunately it only toasts properly on one side, while the other side of the bread only gets dry and warm. I bought it because of its many nice features, good reviews on Overstock and reliance on KitchenAid's quality. If I had gone to KitchenAid's website before I bought it, I would have seen the many poor reviews. Regardless of all the nice features, first and foremost a toaster should toast bread evenly, and if it can't do that then it has failed its primary function. I'm sending it back. Ordered to replace our old KitchenAid toaster that we loved. This one was a disappointment. It looks great, but the toast comes out really uneven. I mean dark on one side and white on the other. I have to turn the toast around midway to get it right. I would not recommend. 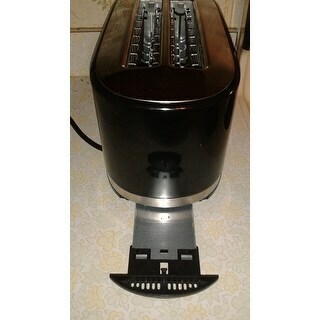 this toaster does not toast both sides of the bread evenly. It only toasted on one side. I sent it back and received a second toaster and it did the same thing. They said they didn't receive the first returned toaster and so now I am stuck with the second one because they can't do anything unless the first one shows up. I lost the return receipt and cannot find a tracking number. I won't be buying products from this company in the future. Beautiful exterior but won't toast evenly. We were very disappointed. We tried a couple different bread types with no luck. I have the whole minus kitchen aide products. I have the entire lining kidney products. Works well he eats out the button time his great. It works quickly easy to again be to full design Are use this every day the color is perfect. While this toaster is aesthetically pleasing. I have been disappointed in the toasting itself. The settings go all the way up to a 6, but when you toast on level 3 it already comes out like a black chard husk of bread. Setting 2 is also over done and setting one is a little light, so I have to stand there and do it 1 1/2 times on setting one. I do however like the wide slots. I now can heat my flour tortillas inside the toaster. For this you use the reheat setting, flipping once and restarting. I am not sure if I will keep it. And I'd really like to understand what you could ever possibly toast on a level 6 when it's already charcoal on 3. This is one of those occasions where your like "You had one job". I love this item that I when ahead and bought another one again. Love all the color combination on this rug. It pulls my golds, silver, tans and black colors. This is just beautiful, I can not believe I found all rug sizes to match and complete the look. Overstock is really the way to go on selection, design and quality. I am never disappointed when it comes to shop online with this guys, truly the make my home beautiful and at the same time the WOW! look all the time. Thanks overstock, I love you!!! OMG...I have wanted a toaster that I can fit my husbands' french bread in when we make sandwiches. It toasts so beautifully and evenly and I never get burned toast anymore. Finally, a toaster that works...looks great on counter and can toast pretty much any size bread slice I like. I like this toaster. It's a little larger than I expected, but that's ok. It toasts very nicely and has a buzzer that indicates the toast is going to pop up, which is great. The only reason I didn't give it 5 stars is because it does have a somewhat load "hum" when you first put the toast down. It does go away after about 10 seconds. just what i ordered very nice, color matched what I had ordered. fits all types of breads and bagels. It is high quality and I love it! Amazing toaster(I can't believe I wrote that)! By far the best toaster I've ever purchased. Evenly toasts and I love the beep tone when toast is done. It's easy to pop bread down and do something else in the kitchen. I think it takes about a minute for bread and bagels. "How wide and long are the toasting slides?" Four in the time And looks so beautyful. The long slots come in handy for longer slices of bread, and I do like the controls on the front of the toaster. It is made in the usa . It is all red with just a little stainless on it , the others had to much stainless . And it will take extra long slices of bread . "Can you only use one slot of the toaster at a time, if you are not toasting 4 pieces of bread?" You are welcome to toast one piece of bread.